Bond and stock market valuations are stretched, economic indicators may be peaking, and central bankers are starting to withdraw liquidity. Is this eight-year old bull market running out of road? How far can valuations rise? It is true that markets could be heading into extra time, but the game may not be over quite yet. Corporate and economic fundamentals remain supportive overall and investors are far from euphoric. The recovery in global stock markets has turned into one of the strongest bull markets on record - eclipsed only by the 1990s bubble in technology, media and telecoms. That in itself need not be cause for alarm. Records, as they say, are there to be broken and bull markets don’t come with a built-in expiry date. Instead, they tend to run out of fuel, so is there enough gas in the tank to propel us to new highs? 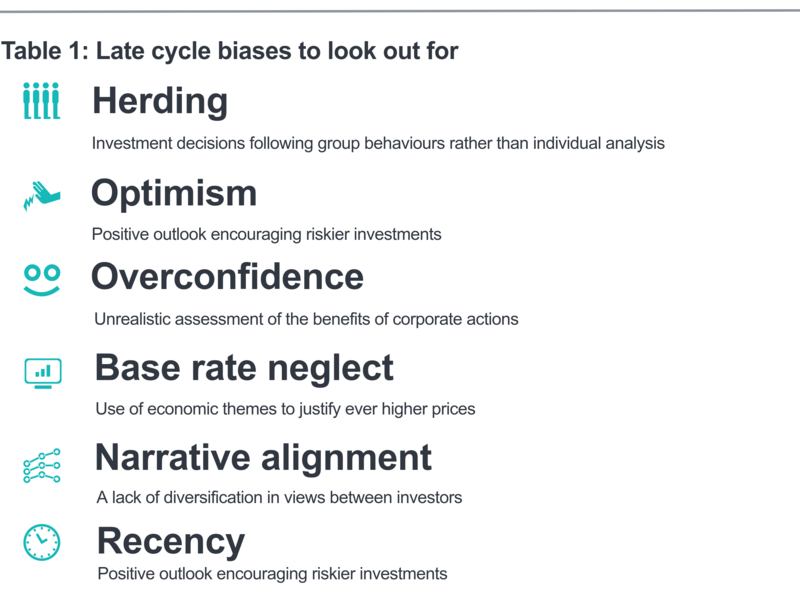 This short paper looks at the fundamental, economic, and behavioural drivers of bull markets. There is little doubt that asset valuations are becoming increasingly stretched and late-cycle behaviours more common. High valuations across markets have been justified by strong liquidity support from central banks, low inflation, steady GDP growth and, more recently, earnings upgrades. But where would further gains come from, when all the key themes that have fuelled this bull market appear to have run their course? Since this bull market began in 2009, equity markets have re-rated as price-earnings multiples soared; the US market is now more expensive than at any time apart from before the great depression and the peak of the tech bubble. Second, sectors built on high intellectual property and intangible assets such as technology have pulled away from the rest, and a handful of large technology stocks are now driving US markets. Third, companies are now buying back their own stock or swallowing competitors at high prices, and bond covenants are weakening, easing restrictions for borrowers. Investors have become increasingly willing to take risk in their search for yield, whether in equities or high yield where most Italian BB rated companies can now borrow at a lower rate than the US government - a remarkable anomaly. However, complacency has also become a feature of the market, as suggested by record low market volatility, institutional fund managers’ responses to surveys about the outlook for markets and economies, and low cash balances for both professional and retail investors. At the same time, monetary policy is turning less accommodative, and earnings growth may well become harder to find. US price-earnings levels are above historical averages, and earnings would need to grow strongly from what are already historic highs to justify rich market valuations. Bull markets don’t die of old age. Neither do they end the same way, but they do all need a trigger, either in the form of faltering growth, external shocks (eg OPEC’s 1973 oil export embargo), structural imbalances (as in the 2008 financial bubble), or some combination of these. There are no compelling signs of imminent slowdown, and company fundamentals remain robust, so there are good reasons to believe that the market can continue to grind higher, as it did in the late 1990s. And on this basis, equities remain more attractively valued than alternatives like cash or bonds. Indeed, leading economic indicators remain encouraging - investors may be optimistic (although hardly euphoric), companies have ample cash on their balance sheets, and corporate revenues, earnings growth, debt levels and cash flows still look sound overall. Fixed income valuations are also supportive of equity valuations, and low inflation will contain interest rate increases. Share price valuations are not excessive outside of the US, particularly relative to the alternatives. For example, you can currently buy SAP shares with an earnings yield that is higher than the yield on European HY bonds. This would seem a little odd. High yield bonds, of course, compensate for the risk that the bond issuer may not perform well over time or may even go out of business, but SAP equity investors could be fairly confident that the company will be bigger in 10 years’ time than it is today. 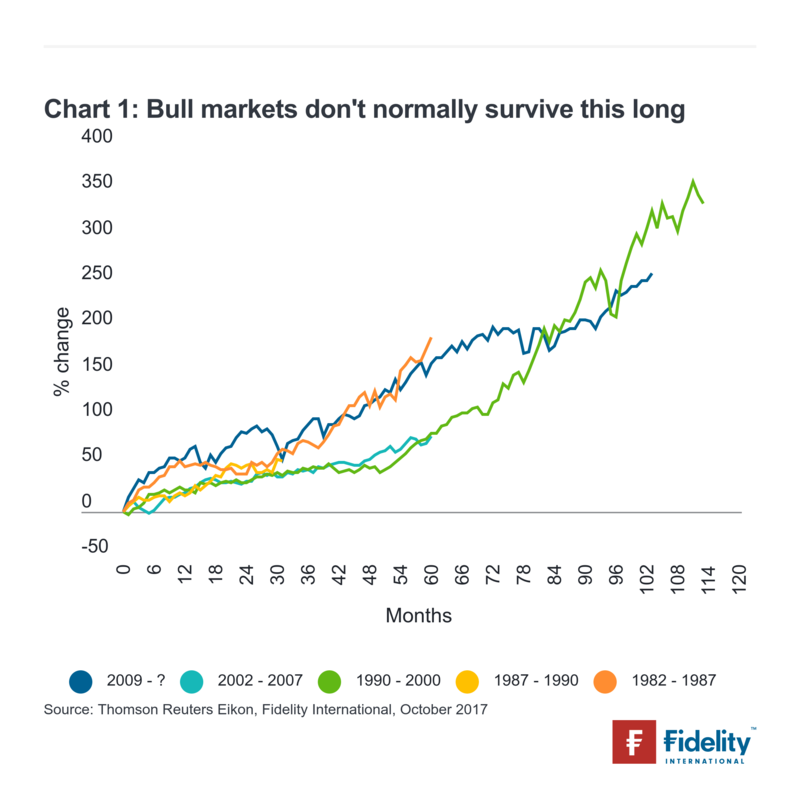 It is worth noting that the market leaders in this bull phase have been different from those history would have led us to expect, so the next bear market may not follow the usual playbooks. 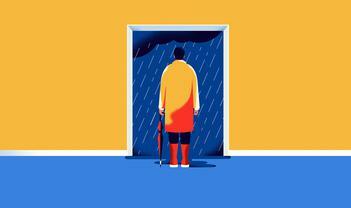 Although it is now almost a decade since the last crisis, many investors were so scarred by the experience that they have been seeking shelter in traditionally defensive areas of the market. This weight of money into such perceived safe harbours has pushed their valuations higher, to the point where they now appear stretched - and may no longer be so safe. 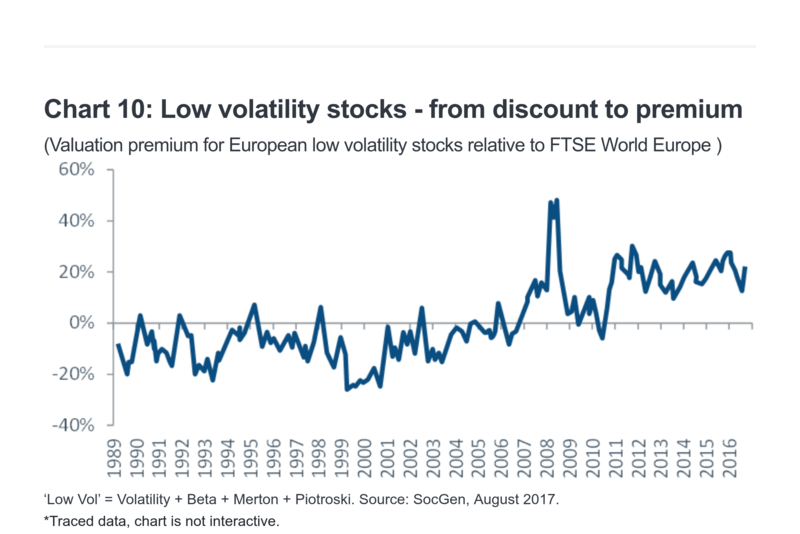 For example, low volatility stocks are very expensive compared to their history, a trend exacerbated by passive exchange-traded funds (ETFs) mechanistically following the herd. As a result, these companies may not provide the same level of downside protection as they did in the past. As growth data is usually released with a lag and tends to be subject to revisions, it is difficult to identify the economy’s current speed at any point in time, or to predict where it might be heading over the next few months. But growth dynamics are important for financial markets. This is why we have created a proprietary leading indicator (the Fidelity Leading Indicator, or FLI), which generates early signals for the global cycle. Encouragingly, our latest FLI reading shows potential signs of reacceleration. Global growth appeared to have peaked in early 2017 before slowing to trend, but is now picking up again. Three of the FLI’s five subsectors-- global trade, commodities and industrial orders--are driving this improvement. In addition, the deceleration in business survey momentum seen throughout the year is showing signs of abating. But the indicator’s consumer and labour subsector, which had provided consistent support to growth over the past year, has now turned into the biggest drag, as consumer confidence seems to have peaked and the improvement in some labour market indicators has now stalled. The tentative reacceleration in the FLI suggests there is no immediate cause for concern for the global cycle. Marginally tighter monetary policy globally (led by the Fed) and fading Chinese stimulus appear to have been insufficient to harm global growth so far, and this year’s weaker dollar has raised the contribution from emerging markets to global growth. But with the current economic cycle looking increasingly mature, this growth reacceleration might not last long. Current growth dynamics increasingly resemble typical late cycle conditions, with only inflation and wage pressures missing. In fact, the current FLI signal looks somewhat similar to 2006-2007 when the global economy reaccelerated before hitting recession in 2008. While history might not be a good indicator for the future, with plenty of potential risks on the horizon, this is not the time for complacency. In 2018, growth could be threatened by the tightening effects of global liquidity withdrawal by central banks, a material slowdown in China’s growth due to the lagged effect of slower credit growth, a reversal of the weaker US dollar trend, and ever-present geopolitical risks - to name but a few. 2018 is likely to prove more challenging than 2017. In the meantime, however, the October 2017 FLI reading is feeding into our models as a materially positive bet to risk assets, for the first time in six months. In finance, as in life, despair is often followed by hope, which is followed by optimism, and euphoria. After euphoria comes anxiety, then panic, before despair sets in again. This helps explain the cyclical patterns of prices in capital markets. But can this framework help us determine whether we are in the final stages of the equity bull market? Investors certainly appear more cautious than in past late-cycle eras, hardly getting carried away by encouraging corporate and economic fundamentals and fretting about stretched valuations. If we can find evidence of widespread euphoria, this would support the idea that equities are a risky place to be invested. But the evidence is mixed, with limited cause for immediate concern. In a truly euphoric market, investors succumb to group dynamics, chasing the same assets. Amateur investors and speculators open brokerage accounts and fund sales spike, as investors fear missing out. Research shows that people judge their own prosperity relative to others’, so seeing peers accumulate wealth acts as a powerful incentive to join the rush. Yet global equity markets data suggests there has been no broad move into equities from private and institutional savers since the financial crisis. Flows in recent years have been restrained, only once hitting the $200 billion mark, a figure which was regularly exceeded in the years leading up to the 2008 crisis. Our client conversations reveal equities are generally owned reluctantly rather than enthusiastically, with many holding significant amounts of cash in the expectation of a significant fall in prices - hardly euphoric. So why have markets continued to rise for so long? The sheer weight of monetary authorities’ buying and the depression of interest rates, yields and other returns that has caused, is one reason equity markets have kept going. Low bond yields have allowed equities to re-rate across the board, making investors more willing to pay higher prices for given earnings. Steady, synchronised economic growth is another, as this has supported corporate earnings. But it is an unusual situation, which is why it’s often called the most miserable bull run on record - nobody has fully bought into it yet despite the fact it has kept grinding higher. Another defining feature of euphoria is that a sense of optimism and positive feeling toward the future becomes widespread. This affects investors’ behaviour by encouraging them to buy (and advise others to buy) risky assets such as equities. Strategists at Bank of America Merrill Lynch attempt to measure optimism in the market by surveying how many of their sell side competitors are recommending an overweight to equities, and by how much. This gives them their ‘sell side indicator’. It shows the sell side consensus to be more positive than at any point in the last 5 years, but well below previous periods of euphoria such as the tech boom. 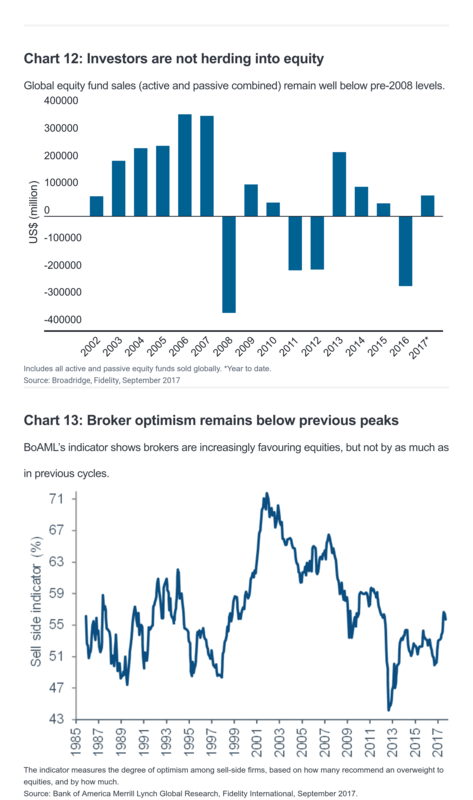 Bank of America Merrill Lynch says this higher level of optimism makes it more likely that US stocks do not deliver positive returns over the next 12 months. This seems fair, although it also does not imply there is an outsized sell-off around the corner. Like optimism, confidence is a highly socially desirable trait, and company CEOs are no exception. A euphoric market will give them an extra confidence boost to make ambitious deals and pursue mergers and acquisitions. Unfortunately confidence can easily turn into hubris, and deals made during periods of market euphoria often destroy value for the buyer once the reality of integrating two corporate cultures and two sets of clients sets in. 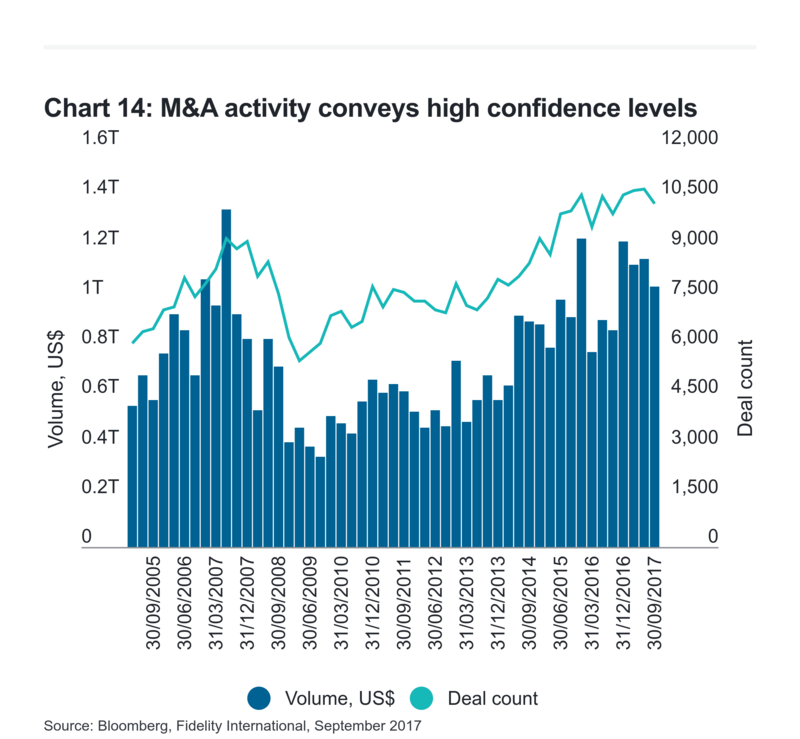 The past three years have seen a sustained rise in M&A, which certainly points to a degree of optimism and confidence in the market. The number of deals now exceeds the peak of the last cycle. For this to become a real cause for concern, and a sign of extreme euphoric overconfidence, the type of deals being done would have to lack industrial logic and not be justified by fundamentals. This is a hard judgement to make, as it can take years for the value created or destroyed by a deal to emerge. The idea of testing for euphoria is a slightly strange one - euphoria seems like something one should feel rather than observe. Still, the data are interesting, showing some heightened optimism compared to recent history, particularly in the US. An absence of widespread euphoria does not inevitably mean markets will rise further, but it does probably mean that if the market falls, the downside risk is less extreme. These are difficult times for investors. Should allocations be changed to account for mounting risk in an ageing bull market, or would this prove premature, and a costly mistake? How far can market valuations stretch, before they snap? At some point, the global equity bull market will run out of steam, and there could be any number of triggers for this. The US economy could falter, stronger-than-expected inflation might force monetary authorities to act more aggressively, or liquidity could implode in corners of the fixed income market. But there are few signs of any such pressures erupting in the near term. Meanwhile, bond yields are low and cash holdings loss-making in real terms. Alternative investments may offer enhanced returns and low correlations to equities, but may not suit all investors. So until the economic outlook changes, markets are taken over by euphoria, or systemic issues arise, it is not surprising that investors are not positioning for a turnaround yet. It may not feel comfortable, and this is not a time for complacency. It is crucial to watch out for changing conditions, and to be ready to adjust risk allocations when that happens. At this stage, market conditions leave investors little choice but to be braver for just that little bit longer. Opinions expressed are as of Nov 2017 and may change as subsequent conditions vary.